The most brilliant of all the constellations dominates our evening sky this week, climbing well up in the south around 9 p.m. local time. It is, of course, Orion, the Hunter. But just exactly who was he? As is also the case with the mighty Hercules, the figure of Orion has been associated in virtually all-ancient cultures with great national heroes, warriors, or demigods. Yet, in contrast to Hercules, who was credited with a detailed series of exploits, Orion seems to us a vague and shadowy figure. The ancient mythological stories of Orion are so many and so confused that it is almost impossible to choose among all of them. 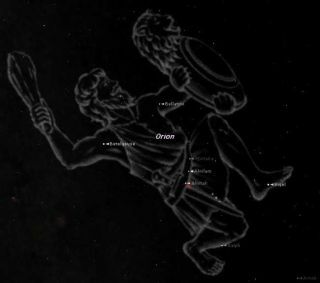 Even the origin of the name Orion is obscure, though some scholars have suggested a connection with the Greek "Arion," meaning simply warrior. All, however, agree that he was the mightiest hunter in the world and he is always pictured in the stars with his club upraised in his right hand. Below Orion's famous three-star belt is undoubtedly one of the most wonderfully beautiful objects in the sky: the Great Orion Nebula. It appears to surround the middle star of a fainter trio of stars in a line that marks the hunter's sword. The nebula is invisible to the unaided eye, though the star itself appears a bit fuzzy. It is resolved in good binoculars and small telescopes as a bright gray-green mist enveloping the star. In larger telescopes it appears as a great glowing irregular cloud. A sort of auroral glow is induced in this nebula by fluorescence from the strong ultraviolet radiation of four hot stars entangled within it. Edward Emerson Barnard (1857-1923), for many years an astronomer at Yerkes Observatory, once remarked that it reminded him of a great ghostly bat and that he always experienced a feeling of surprise when he saw it. The Great Orion Nebula is a vast cloud of extremely tenuous glowing gas and dust, approximately 1,600 light-years away and about 30 light years across (or more than 20,000 times the diameter of the entire solar system). Astrophysicists now believe that this nebulous stuff is a stellar incubator; the primeval chaos from which star formation is presently underway. One of the pleasures of stargazing is noticing and enjoying the various colors that stars display in dark skies. These hues offer direct visual evidence of how stellar temperatures vary. In Orion, ruddy Betegeuse and bluish Rigel provide an excellent color contrast but we can easily find other colors as well. Look at orangish Aldebaran and yellowish Pollux. And considerably removed from the winter groupings, is brilliant topaz Arcturus, usually regarded as a spring star, but now, in the dead of midwinter, rises this week between 10:30 and 11 p.m. and quickly holds forth in solitary splendor in the east-northeast. Even as you observe these stellar colors, do you notice that they're recognizable only for the brightest stars? This is due to the physiology of the eye, more specifically, the fact that the color sensors on the retina – the cones – are insensitive to faint light. Under dim illumination the retinal rods take over. But their greater light sensitivity is offset by their color blindness. This is why we see all faint stars as white. However, if we look at them through binoculars or a telescope, their amplified brightness stimulates the cones, which detect their color.